Everyone at this point knows that the sequel you rejected is the real Mario 2, and that Mario USA is just a reskin of Doki Doki Panic. Apparently, because the American version of the Mario Portal is missing Lost Levels. Don’t get me wrong, Mario USA isn’t a bad game. But I don’t like how Nintendo of America insists that Lost Levels isn’t part of the core series. At this point, denying that SMB2 is a "real" Mario just because of what it technically is rather than acknowledging its overall legacy and inspiration to the Mario franchise is doing a huge disservice to the Mario franchise. I do agree that Lost Levels should be acknowledged, but please don't argue its importance to the Mario series over Super Mario Bros. 2 USA. They're both real Mario sequels. Yeah. Even as soon as SMB3, Bob-Ombs moved over to the "main" games. By SMW the likes of Pokeys, Pigits & Ninjis were bleeding in. Every time Peach is playable, they homage SMB2 with her floatiness. Shy Guys & their derivatives keep showing up, as does Birdo(s). Captain Toad even chucks the vegetables from SMB2 as his main attack! And that's just the stuff off the top of my head. There's definitely more. I’m not denying that it’s part of the core series. Yes, it’s a fine game, and yes, it’s part of the core series as much as any other game. The one thing I'm denying is something Nintendo keeps pushing: it's not Super Mario Bros. 2. Mario USA is a mainstream game, but it’s like Super Mario Land: it’s not a sequel, but it’s an independent game in the main series. It's ultimately up to Nintendo to decide, and they clearly disagree with you. Indeed, at least Nintendo of America, that is. Nintendo of Japan seems to agree with me. and after all, we only got the Japanese SMB2 as part of Super Mario All-Stars or as VC title, so I can see why they don't bother listing it. Didn't know the Mario Portal looks like that in Japanese. It's interesting that Waluigi is listed as part of the main Mario characters, since unlike the other characters in that list he started in a spin-off game, compared to the others where they started life in either a Super Mario game, a Mario game in Luigi's case, or a Donkey Kong game in Donkey Kong and Diddy Kong's case. Even Boo is listed so I guess he's the most popular Mario enemy, over even the Koopa Troopas themselves! The site has been updated (May 15). The Mario Tennis series is added in the "game collection" section. Too bad it doesn't include Mario's Tennis. I guess Mario's Tennis isn't all that popular, or are they just ignoring Virtual Boy games? I won't be surprised since they have a very short run so they never have time to settle. Now I wonder if a Mario Golf page will eventually have the NES Open Tournament as part of the games, since it has Mario characters despite not being named "Mario". They'll probably add more sooner, with their own bio. Toadette and Birdo would be one of them. Goomba, Koopa Troopa, Paratroopa, Dry Bones, Hammer Bro. 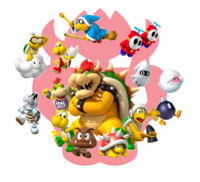 and Lakitu are popular enemies, among others, should be added (if looking at this group art below). Or they only restrict to Mario Tennis games developed by Camelot. They're never going to call it by a name it has never received in the English-speaking world. There's a reason 2J became "Lost Levels" in Super Mario All-Stars (and that's not just because it's basically DLC in a pre-DLC world). Or do you also object to them not calling the SMW prequel Yossy Island rather than Yoshi's Island? You seem to have missed my point. I’m fine with Nintendo changing game names outside of Japan. But the title Super Mario Bros. 2 was intentionally chosen to deceive American gamers (and by extension, European gamers) into thinking that Mario USA was the direct sequel to Super Mario Bros. 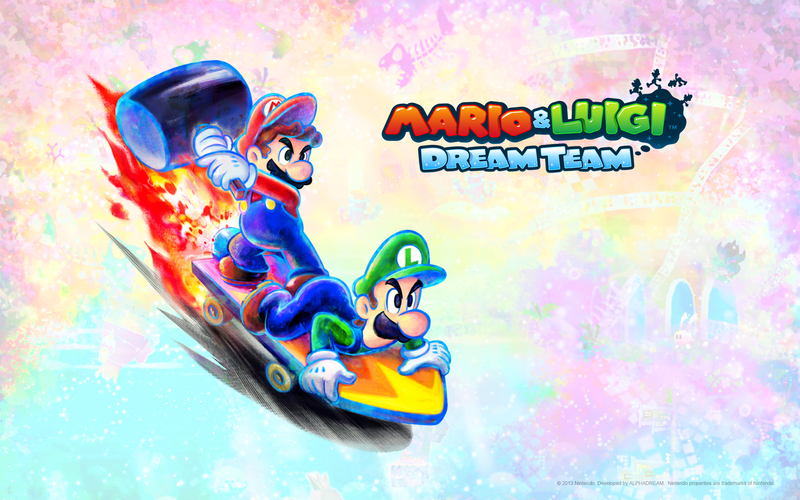 They could have called Mario USA "Mario's Dream World" or something like that, and then they could release Mario 3 and World before Lost Levels. Nintendo's done it before with other game franchises, after all. But no; instead, they tried to overwrite Mario 2 by giving Mario USA the same title. In my opinion, that was a bad decision. But really, this discussion isn’t getting anywhere, and this isn’t the right thread for it anyway.